Fabric is opaque so that you can wear on its own or as a cover up. Mix and Match Maaji swimwear: Lavender Sundaze Wave Reversible Bikini and Lavender Lofty Wave Reversible Bikini. 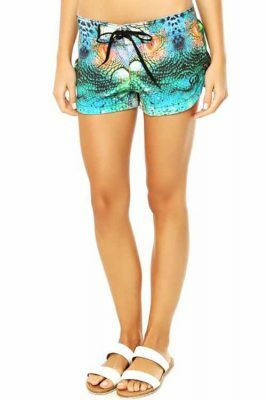 Maaji’s Juicy Pine Shorts are a part of the 2017 Sunny Dream Inn Collection. Comfortable elastic drop-waist design with adjustable ties. Brass accents on ends of string ties. Crochet scalloped hem and trim along pockets. Wear on its own or as a cover up. Lightweight and cool against skin.